Shortly after arriving at our rented house here in Plovdiv, I heard some of the kids getting very excited to find a ladle in one of the kitchen drawers. "Look! We have a ladle!" someone said, and there were general exclamations of celebration. 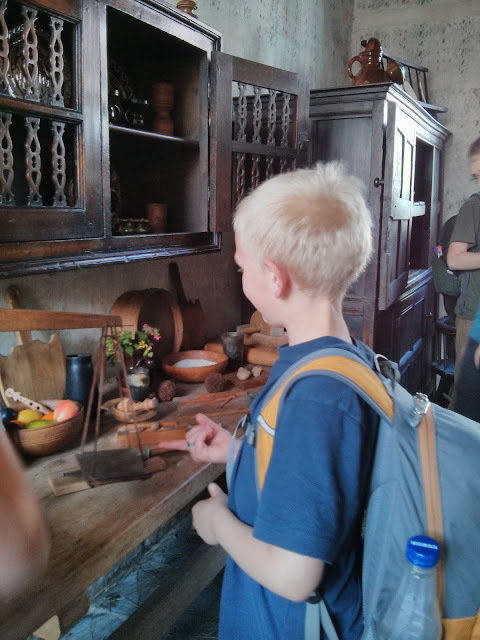 This illustrates perfectly the challenges we've had with various kitchens during our Home School Field Trip. With each new residence, we get to find out what the kitchen has and doesn't have and then figure out if it's workable or if we need to beg for something from the landlord or buy something. This is not our kitchen. 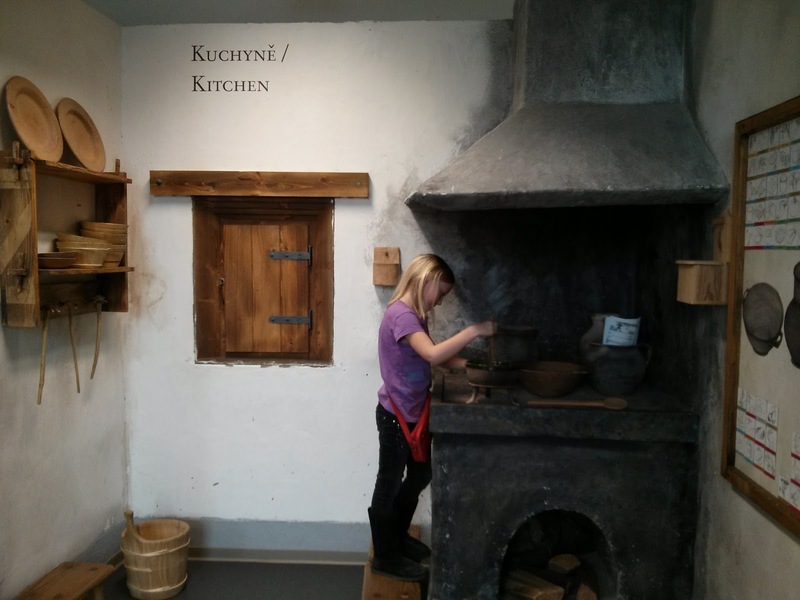 It's a replica of a medieval kitchen (I think) at the Prague City Museum. Here's what I now consider to be essential in a kitchen: a big soup pot, a frying pan, a couple of wooden spoons, a large bowl, cutting boards, knives (including a bread knife), pancake turner, something for baking in (this was two roasting pans in our first Prague apartment; here in Plovdiv, it's one cookie sheet and a couple of bread pans). Things that are almost necessary, but we've done without them in a couple of places: colander, vegetable peeler, whisk, cookie sheet (unless there's no oven, which was the case in our Prague apartment during our second stay). And things that we have done without most of the time: measuring cups and spoons, ladles, spatulas, various baking pans (like muffin tins and pie plates), and all electrical appliances. A blurry picture of me and Lillian in our first Prague kitchen. I loved the pots and the teapot! Well, there's one electrical appliance that we've had in every place, even in the small Premier Inn rooms we've stayed in for one night on two different occasions -- an electric kettle. Presumably these are ubiquitous to accommodate the tea-drinking British travelers. Anyway, I love the electric kettle! We use it all the time for making fruit or herbal tea and sometimes just to boil water for some recipe. It boils water super fast and then turns itself off. You can probably get electric kettles in the U.S., but I had never seen one before. I like to keep my electrical stuff to minimum, but I'm thinking about getting one when we get home. My brother Colter cooking with the kids in our Dresden kitchen, which was quite large and well-equipped, except that the knives (from Ikea) were terrible! Something else that most of our temporary homes have not had is containers for storing leftovers. My solution for this is to buy ice cream and yogurt and anything else that comes in plastic tubs and wash and reuse the tubs. I actually do this kind of thing at home a lot, too, so it's kind of automatic. 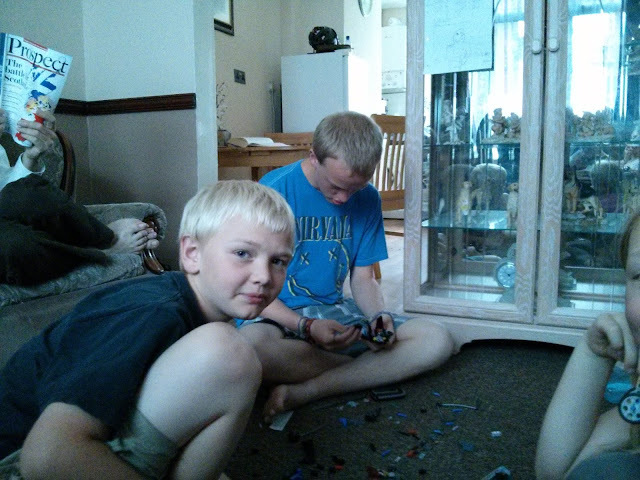 This is also not our kitchen, but I wish I could try it for a while! This is the kitchen in an Elizabethan mansion in Conwy, Wales. Right at the beginning, we bought a couple of those flexible plastic cutting boards at Ikea, some kitchen towels, and a couple of dishcloths, and I've been carrying them around with us ever since. I also got a simple serving tray (like a breakfast tray) that we sometimes use for food but more often as a lap desk kind of thing so my laptop doesn't get too hot sitting on the bed or a chair or whatever. These are not things I thought I would be hauling around Europe with us, but they've been handy! You can see a little bit of our Pocklington kitchen behind Zed here. I had already forgotten that the refrigerator was there next to the table. 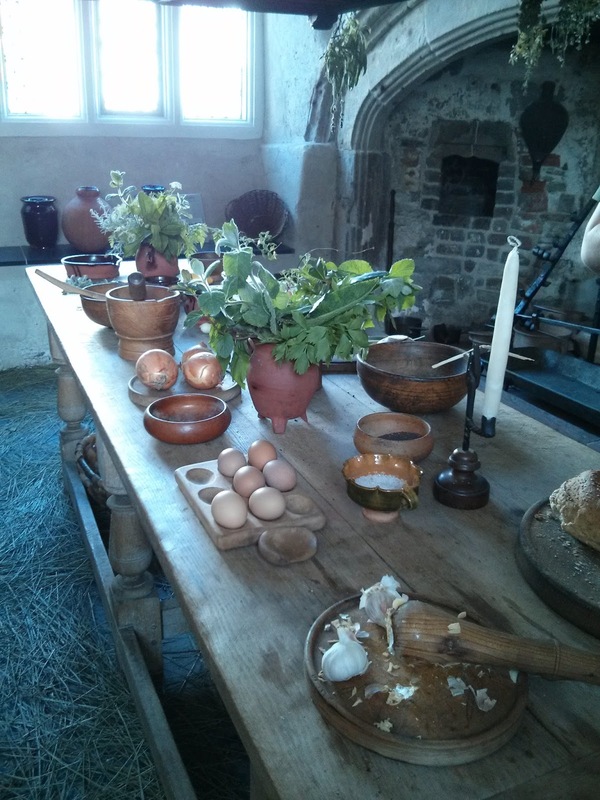 It was a good-sized kitchen and even had a diminutive dishwasher, but the table was small and only a few people could use it at one time. Unfortunately, I don't have a picture of the tiny kitchen in our second (August to November) apartment in Prague. 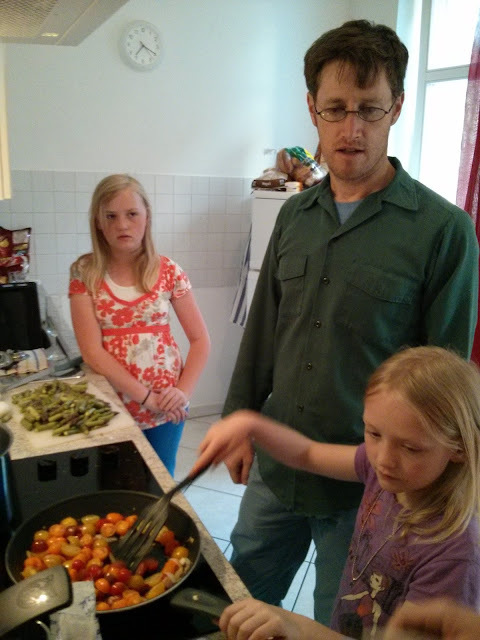 It was big enough for one person -- stove straight ahead, sink to the right, counter to the left, no oven. The refrigerator, which was European medium size, was not inside the kitchen area, but in a passageway that included a bar. Sounds weird, but it worked. The tiny kitchen reminded me of some I've seen in Manhattan. Truly tiny. 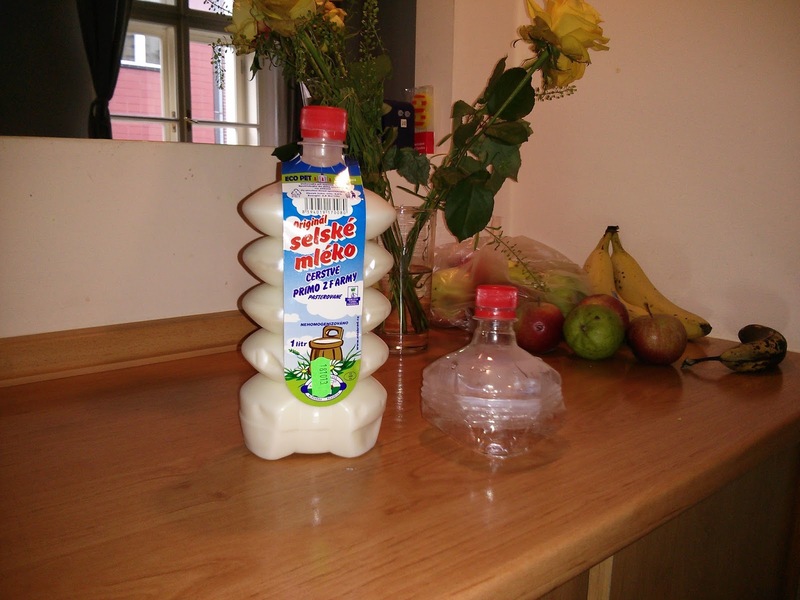 A funky Czech milk bottle, one full and one smashed for recycling, on the bar in our second Prague kitchen. 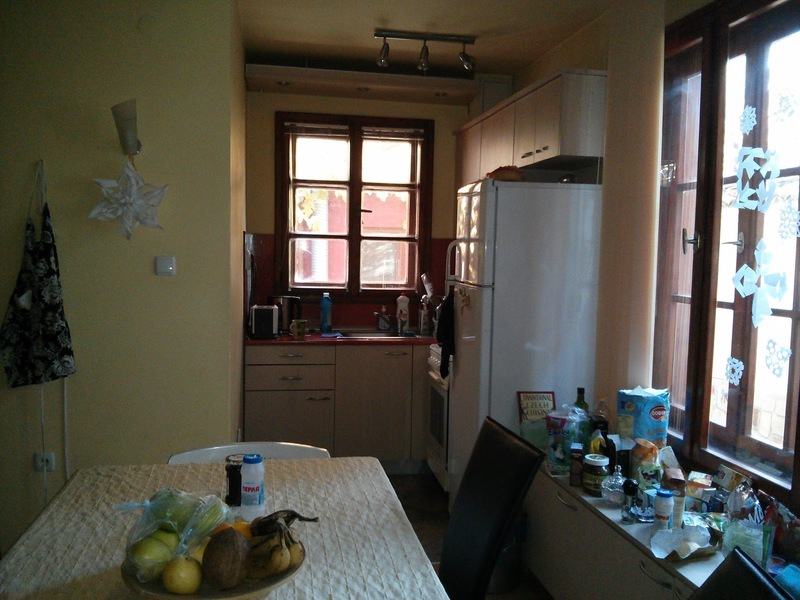 Here's our kitchen now, in Plovdiv, Bulgaria. I'd say it's about twice as big as the one in Prague. And the refrigerator is huge compared to the others we've had. There's not a lot of cupboard space, which is why our food is on top of the cupboards to the right. After a year of moving seven times (eight if you count the one weekend in Liverpool when we had to leave our house for previously booked renters), I'm pretty excited to get back to my own kitchen. I think it's going to feel pretty big and well-equipped!